Crop stage and uniformity. Is the crop close to swath timing? If some plants are at the target swath stage (ideally 60% seed colour change on the main stem, or later) but others are still too green, you probably want to wait to swath – especially if most of the yield potential is in those later plants. Potential losses from shelling out of most mature pods is likely more than offset by the yield gain of letting more of the seeds in later pods to reach maturity. If the variety has the pod shatter tolerance trait, the field could be left for three to four weeks before those first-maturity pods start to shatter. If still highly uneven after that time, farmers may opt to desiccate or swath the crop to dry down green stems for improve harvest efficiency. Read “Harvest timing for an uneven field“. Lygus. Count lygus and compare numbers to thresholds. Note that if swathing is a week away, pods may be too tough for lygus to penetrate. Lygus scouting, thresholds and timing. If choosing to spray, find a product that fits the pre-harvest interval. Bertha armyworm. These big eaters can be in isolated patches. If only a small area is at threshold, a localized spray can be very effective. Also note that a few big worms on pods at the top of the canopy may look bad, but numbers could still be well below thresholds. Bertha armyworm scouting tips. If choosing to spray, find a product that fits the pre-harvest interval. CSPW exit holes. Cabbage seedpod weevil larvae will eat some seeds inside a pod then dig out, leaving an exit hole. If 25% of pods or less have exit holes, one can assume that a spray did its job. Or, if you didn’t spray, you made the right decision. If more than 25% of pods have exit holes, damage exceeded economic thresholds. A check strip would be especially helpful in determining whether a spray paid off. Clubroot. Look for plants showing clear signs of stress – either wilting and yellowing while others appear OK. Clip the stems to check for blackleg and dig up the roots to check for clubroot galls. Also target plants without clear signs of stress. Check random plants in higher-risk areas near field approaches. Read more scouting tips. With clubroot showing up in new areas across the Prairies, the approach is to prove to yourself that you don’t have clubroot. Manitoba Agriculture’s Holly Derksen talks about clubroot in new areas. If unsure about clubroot ID, send samples away for DNA testing. When making field scouting notes, include the variety name. Blackleg. Fields that started the season with moist soil conditions and fields that had hail early in the season could be at higher risk for yield-damaging blackleg. Fields in a tight canola rotation are also at higher risk. Clip stems to check for blackleg severity. Do 50 random stems (not just clearly damaged stems) to get a true picture of incidence (% of plants infected) and severity (average blackleg rating) for the field. If average severity is moving beyond 1.5 toward 2 or more, this is a clear sign that the blackleg resistance in the variety is no longer appropriate for this particular field. 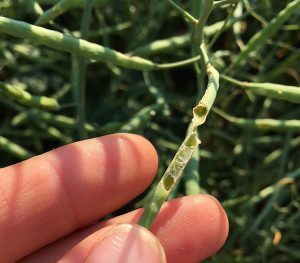 The blackleg pathogen population has shifted and R-gene rotation will be required the next time canola is grown on that field – unless the plan is to take a three-year break from canola. When making field scouting notes, include the variety name. Read more. Weeds. Are those patches herbicide resistant and to what? Or are they just escapes? —Herbicide resistant weeds tend to be in patches of all the same weed. Other weeds were controlled while this particular species-specific patch was not. Herbicide resistant weeds also tend to be in patches of irregular shape, starting off as one weed and going out from there as seeds shell out or the combine spreads them around. In the case of glyphosate-resistant kochia, plants are often in long lines as the resistant parent tumbled along dropping seeds. Wild oats will be in patches that spread out from the original resistant plants. Stubble counts. Plant counts often drop 10-15% through the season. If more severe than that, check scouting notes and consider the most likely reasons – Insects? Weather? Disease? – and whether there’s a profit-improving way to prevent this. Seed choice may be part of the solution. If counts increase, which is also possible, take a close look at all plants in the harvest count to see how many are actually contributing to yield. Small spindly plants that emerged well after all the others may not have that many pods, and should not be included in the count. Read more.